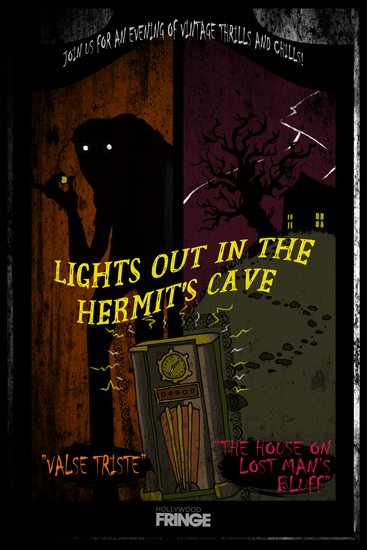 Hollywood Fringe - lights out in the hermit’s cave! From the airwaves of the 1930s & 40s to the stage, we present Lights Out in the Hermit’s Cave. This is a live double feature performance of radio plays from two classic radio horror shows. From The Hermit’s Cave we present “The House on Lost Man’s Bluff.” It’s the story of three travellers, Nan, Charly and Denton, who are forced to take shelter in a mysterious isolated house. It’s just for a night, so why is Denton acting so strange? And what about that maniacal laughter? From Lights Out we present “Valse Triste.” Dolly and Laura are two city girls on a camping trip. They meet John Boyd, a “gentle man” who aims to decide their fate by chance and the flip of a coin. There will be live Foley, old timey commercials, and horror trivia. Join us for an evening of vintage thrills and chills!